04/27/07 – UPDATE | SDTEKKEN.COM - TEKKEN News Resource! The 5th “King of the Iron Fist Tournament” has ended with Heihachi Mishima missing and the eventual winner being Jin Kazama. Jin Kazama then assumes the role as head of the Mishima Zaibatsu and beings using the special Tekken force units for propaganda and manipulative acts all over the world. Eventually many people become upset by this and it starts riots and eventually war amongst nations. With the world now at war, many nations lose their power and the Mishima Zaibatsu declares itself as an independent nation. The Mishima Zaibatsu is intent on conquering the world with only G Corporation to stand in its way. People around the world see G Corporation as a savior and G Corporation offers a price on Jin Kazama to anyone that can bring him in alive. Just as anyone could have expected, the announced for the 6th “King of Iron Fist Tournament” was under way. Those that want to make a name for themselves, those that seek money, and those that want revenge. Many different ideals and goals gather while the Tekken 6 tournament is unveiled. Leo’s father is a world famous detective. Leo wants to become just like her father. Her father ends up missing before the tournament is announced. Leo is of German ethnicity and practices Hakyokuken style of martial arts. Leo’s mother works in the same G Corporation division that may have betrayed Kazuya. Leo lived happily with her mother until she is murdered. The murder investigation ends abruptly and after mourning Leo decides to take matters into her own hands. Upon further investigation into the murder, Leo notices that a name, “Kazuya Mishima” keeps showing up and then decides to enter the next Iron Fist Tournament to get her revenge. Zafina is a guardian to the tomb of a royal family at a village that has been around for centuries. The sealed grave is believed to protect the well being of the tribe. Many martial artists have tried to enter the tomb but Zafina has single handedly defeated them all. Zafina follows the ideals of astrology and finds out that something very bad is going to happen, something that could possibly lead to the end of the world. One day the village elders prophisized that when two “evil stars” meet, the seal on the graves will be broken and the world end. Zafina leaves the village to see if the world is really going to end. After being assaulted by the Jack force, Heihachi wakes up only to find out that the “King of Iron Fist Tournament 5” has already ended. He goes back to Zaibatsu headquarters only to find the Tekken force blocking his way. After the next Iron Fist Tournament is announced and Heihachi finds out that Jin Kazama is the new head of the Mishima Zaibatsu, he is enraged and declares that he will get everything back. Trying to avenge his fallen Manji clan comrades, while going after Bryan Fury, Yoshimitsu realizes that his sword is weakening. His sword is a cursed blade. By killing evil doers and villains the sword would retain its power, otherwise the cursed sword will make the user go insane. Yoshimitsu realizes that he can no longer use his old sword and decides to use another blade that seals the properties of the cursed sword. He then decides to enter the King of Iron Fist 6 Tournament. Kazuya Mishima has figured out which division of G Corporation was the one that betrayed him and viciously killed them all. Kazuya has now risen to the head of G Corporation in the shadows. The world is now against the Mishima Zaibatsu and Kazuya fuels the fire by leading G Corporation against it. 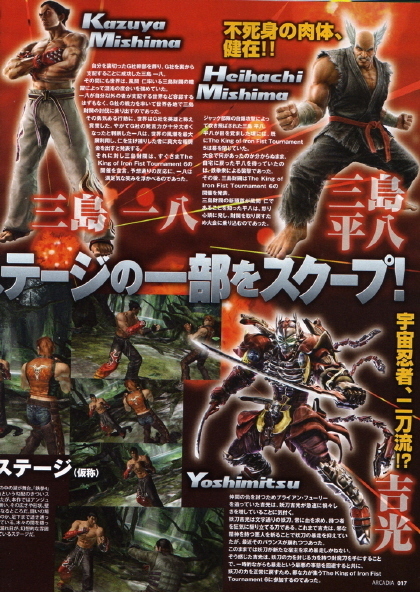 Kazuya can’t stand anyone else conquering the world other than himself so he decides to go against Jin Kazama and the Mishima Zaibatsu. Kazuya realizes that G Corporation is very influencial amongst the people of the world now and he announces that anyone who captures Jin Kazama alive will receive a handsome cash reward. Immediately following his announcement, the King of Iron Fist 6 Tournament is announced by the Mishima Zaibatsu. Kazuya predicted this would happen and began to laugh hysterically. Leo is the child of world-renowned male spelunker, and a top female executive of the biotech firm, G Corporation. Leo’s father, whom she respected, disappeared during an exploration when she was a child, but even so, she strove to become an explorer like her father. She grew up to be a straight and narrow person with her kind mother, but her happy days came to an abrupt end when someone killed her mother. Saddened by her mother’s death, she shut everyone out of her life, but the unexpected and inconclusive end to her mother’s murder investigation, prompted her to continue the investigation on her own. Not too long after she started her, she came across the name of a man named Kazuya Mishima, G Corporation’s very own. And as G Corporation was praised as the world’s savior, all attempts at approaching had ended in failure. 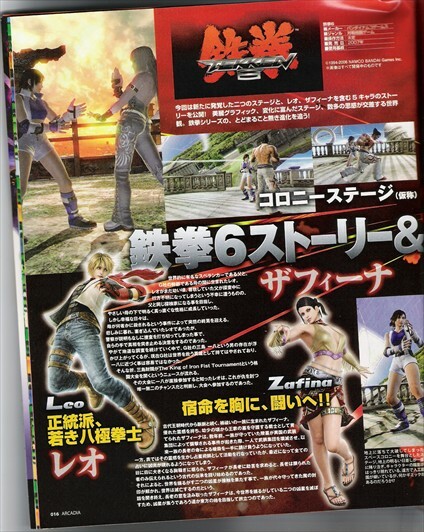 News of the Mishima Financial Group opening a martial arts tournament called The King of the Iron Fist Tournament was spreading, and knowing that Kazuya was going participate directly in the tournament, Leo too followed suit, believing this would be her only chance to avenge her slain mother. Zafina, who has great spiritual powers, was born to a group of spiritual warriors with an ancient past. Since childhood, Zafina was raised to be a protector of an imperial tomb. Several years ago, a foreign army attacked the imperial tomb she and her group were protecting, and Zafina single handedly wiped every single one of them out. Since then, the group’s guru appointed her to be its sole assassin. In her public life, she uses her spiritual powers as an astrologist, but recently she can only see evil omens, and her premonitions grow more and more intense day by day. Seeking to understand the meaning behind all of this, Zafina sought the advice of her guru, and he began to tell her an ancient tale passed down from generation to generation only to a select few. According to the tale, two evil stars will shake the world when they come into contact, and, inevitably, the two will unite with the sealed ancient evil being protected by her group, destroying the world. Zafina considered the meaning behind the guru’s tale and her premonitions well. Setting out on a course that took her far east, to the place the evil stars were believed to be gathering, she journeyed with the intentions of destroying them.